Therm-ic's most powerful and longest lasting battery! Therm-ic boot heater systems are easy to use, easy to install and suitable for any boot. The Therm-ic SmartPack 1600 with Remote Control is designed for boots already pre-wired with heating elements. Some boots that are pre-wired are from Atomic, Dalbello, Salomon and Burton. The SmartPack 1600 with Remote Control is unique because it uses Lithium-ion batteries which are lighter in weight than AA or nickel metal hydride batteries. Lithium-ion batteries weigh almost half of what the other system batteries weigh and are smaller in size. • Suitable for use with all Therm-ic heating systems and insoles with built in heating systems. • Easy to install. Just clip them on, plug them in and turn on the power. • Warmth up to 29 hours with freshly charged batteries. The batteries can be charged up to 1000 times. • 3 levels of heat that allow you to determine how much heat you want and determine how long your batteries last. • With the remote control, there is no need to bend over to adjust the power to your batteries. All you need to do is touch the button on the remote and both batteries will adjust at the same time. • Low setting: 37C or 99F for 21 - 29 hours of use. • Middle setting: 45C or 113F for 9 - 13 hours of use. • High setting: 70C or 158F for 4 - 6 hours of use. The time of use depends on the charged status of the batteries, the age of the batteries and the outdoor ambient temperature.For longer battery time, don't leave your batteries on all day. For instance, turn your batteries off when inside for break or lunch. • Instruction booklet on how to use. 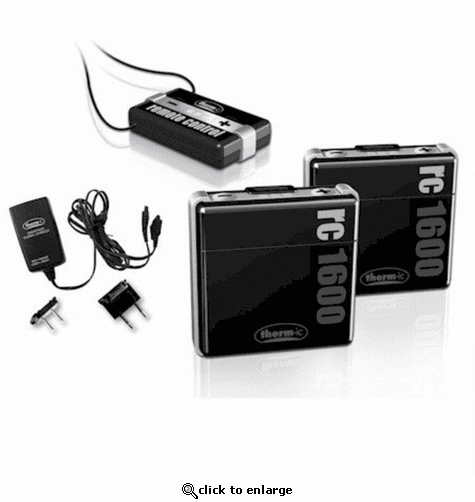 • 2 SmartPack 1600 Lithium-ion battery packs with clips. Both batteries have integrated heat stage switches. • Battery specs- Weight 3.0 ounces, size- 2" high x 2" wide x 3/4" deep. • 1 global battery charger that works in North America, UK and Europe. Offers controlled charging with charge time between 2 and 4 hours. The charger has an additional feature that prevents overcharging which allows for longer battery life. • 1 remote control. All you need to do is touch the button on the remote control to adjust your heat which can be stored in a pocket or around your neck and both batteries adjust at the same time. • Therm-ic warranties their products for 1 year against any manufacture defect.